Booking Mama: Review: Unbelievably Gluten-Free! Summary: Unbelievably gluten-free pizza! Unbelievably gluten-free fried chicken! Unbelievably gluten-free pasta! Plus breads, dumplings, fritters, pies, cakes, puddings, and more. 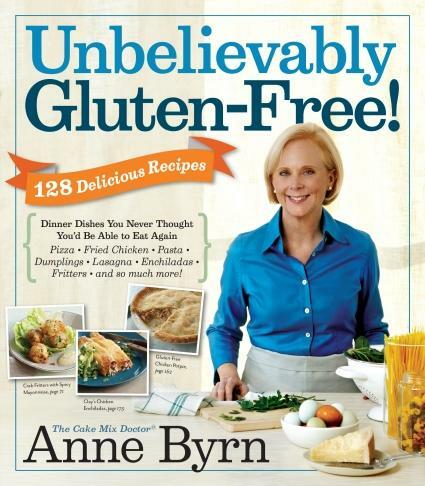 For the 30 million Americans who have an allergy or sensitivity to gluten—and their families, who want to reclaim the dinner experience of everyone eating the same thing—Anne Byrn creates 125 amazing dishes where the gluten is gone, and never missed. Currently, my family's diet is not a gluten-free. My son is able to eat gluten and I can't imagine taking any more foods away from him considering he's allergic to eggs, dairy, tree nuts, peanuts, and shellfish. However, I think we all know someone who is on a gluten-free diets. In fact, I've even considered it for myself based on my husband's chiropractor's recommendation. But I always ask myself if I'm really willing to give up pasta and bread as I know it! I was pleasantly surprised by UNBELIEVABLY GLUTEN-FREE! There were over 120 recipes and some were for foods that I never imagined could be tweaked to be gluten-free. In addition, all of the recipes were so easy to make. 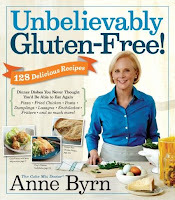 For those of you familiar with Ms. Byrn's other cookbooks, UNBELIEVABLY GLUTEN-FREE! has a similar look and feel. There are many full color photos of the dishes as well as step-by-step directions. And this might be my favorite part (because of my son's food allergies) -- there are suggestions for how to make the recipes dairy-free... when possible. UNBELIEVABLY GLUTEN-FREE! begins with Ms. Byrn's ideas about having a gluten-free kitchen. She provides helpful advice for how to stock a gluten-free pantry, fridge and freezer. 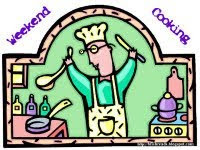 Then comes the recipes... and you might be surprised by a few of them like the breads and the pastas! The cookbook is divided into the following chapters: Breakfast and Brunch All Day; Little Snacks and Nibbles; Soups and Stews; Gluten-Free Bread; Chicken, Meats, and Other Mains; Pasta and Pizza Night; Salads and Sides; and Sweets for Every Occasion. I decided to make the Gluten-Free Mac and Cheese. I figured it was fairly safe because I actually don't mind the gluten-free pasta options. Plus, this recipes has loads of heavy whipping cream and cheese, so how could I go wrong? I ended up using a macaroni that is a mix of corn and quinoa (just like the author suggested), and I actually was quite impressed with the result. While the pasta was a slightly different consistency, it still tasted like a very rich macaroni and cheese. I chose not to do the bread crumb topping, but I did bake it in the oven for a little browning effect. 1. Fill a large pot two-thirds full with water and bring to a boil over medium-high heat. When the water is boiling add a pinch of salt and stir in the macaroni. Cook the macaroni until it is just done, 5 to 6 minutes. Drain the macaroni in a colander and toss it with olive oil or butter. Set the macaroni aside. 2. If you are baking the macaroni and cheese, preheat the oven to 400 degrees F.
3. Add the cream to the pot in which you cooked the pasta and let come to a boil over medium heat., stirring. Let the cream cook until it has reduced to half its volume, about 1 1/2 cups, 15 to 20 minutes. Turn off the heat and stir in the cheddar and Parmesan cheeses and nutmeg. 4. When the cheeses have melted completely, stir the cooked macaroni into the sauce. You can serve the macaroni and cheese at once sprinkled with paprika. Or to bake the dish transfer the macaroni and sauce to a 2-quart baking dish. Toss the cracker crumbs with the melted butter and scatter them over the top. Sprinkle the cracker crumbs with paprika. Bake until the macaroni and cheese is bubbly and the crumbs have browned, 8 to 10 minutes. The macaroni and cheese can be refrigerated, covered, for up to 3 days. I think UNBELIEVABLY GLUTEN-FREE is a must-have addition to any of you with a gluten-free diet. I am definitely looking forward to trying more of these recipes in the near future! 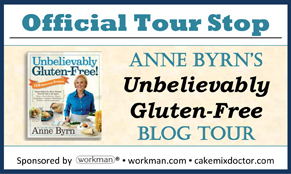 Thanks to the publisher for providing a review copy of this cookbook and allowing me to participate in the UNBELIEVABLY GLUTEN-FREE Blog Tour. Over the next few weeks, I will be sharing more about this fantastic cookbook and trying some new recipes. There will also be a fabulous giveaway so stay tuned. I agree - it's hard to go wrong with whipping cream and cheese! OK, so here's my question, but I'm not sure you can answer it. Do you cook GF very often? I'm guessing not (and I certainly don't blame you, given the circumstances!). I actually find that I rarely use ANY of the GF cookbooks I have. They're good cookbooks, I think, but at 3+ years gluten free, I still rarely bake from scratch (so many ingredients, that rarely overlap from one thing to the next, and cooking's generally a breeze to convert. Sigh. I'm not sure I even got my question out, but there you have it. From my low-fat eating perspective, that dish looks like a rare, but yummy, treat. I don't know a thing about going gluten-free, but I'm glad to see that there are products and books to help people who need it. It sounds as though you have a more difficult road than most what with cooking around allergies - bravo for trying gluten-free recipes as well! My sister-in-law has two daughters who eat gluten-free and I'm going to pass this one on to her. Thanks! i enjoy the challenge of finding gluten free dishes to make for my sister when we have family gatherings. the bonus is that she really appreciates my efforts. We aren't gluten free either but I have quite a few friends who are. I'll have to tell them about this cookbook because I know cooking gluten free can be challenging. That was a rich and satisfying version of mac and cheese. Can't wait to test drive some of the other recipes in this great new cookbook. While we are not a gluten-free house we know several families choosing to eat that way or eating that way because of allergies. I'd love to check out some of her recipes, especially for baking.